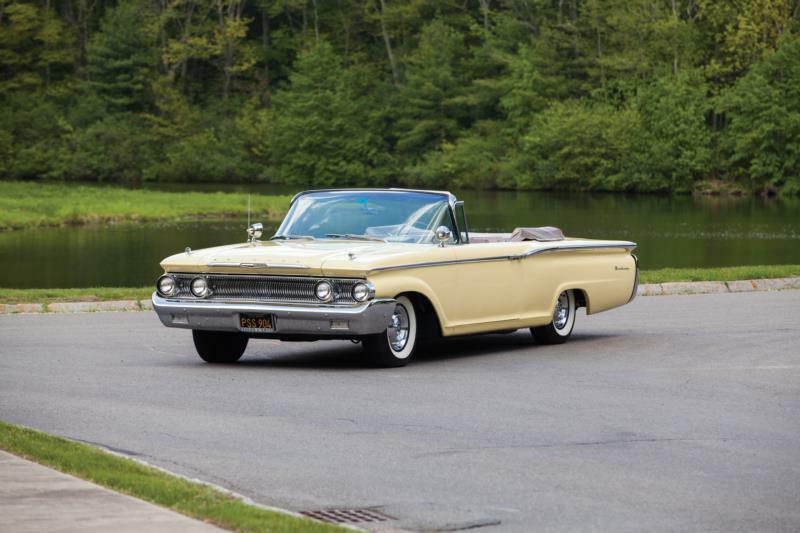 Mercury substantially redesigned the full-size Monterey for 1959, moving away from the elaborate late-1950s styling and towards the leaner, flatter designs of the early 1960s. Body styles matched the 1958 model year, with a four-door sedan and hardtop, two-door sedan and hardtop, and a convertible. The base engine for the Monterey once again became the 312-cid, 210-hp motor that was absent from 1958 production. A 383-cid option at 280 or 322 hp, and a 430-cid V-8 with 345 hp were also available. For 1960, Mercury again restyled the Monterey to keep pace with the times. Body changes included a creased beltline that ran the entire length of the vehicle, turning into horizontal fins, and vertical taillights that were integrated into the bumper. Basic body configurations remained unchanged from the previous year. Engine options for 1960 again started with the standard 312-cid V-8, now rated at 205 hp, with optional motors including the 383-cid engine at 280 hp and the 430 V-8 at 310 hp. Convertible Mercury Montereys from this generation are particularly rare and desirable today, and the stylish two-door hardtops are also sought-after, especially when equipped with one of the more powerful engines. High production numbers make ownership relatively straightforward, and maintenance is typically a non-issue. Finding the right Monterey is also fairly easy, though the 430 engines are predictably harder to locate. Air conditioning is another rare option that is valued by enthusiasts.